The degree to which the strength of density dependence will serve as a buffer from disturbance will depend strongly upon the extent to which the population of interest is demographically 'closed'. In the simplest case in a closed system, there is no emigration from a population and thus all births that occur in a population contribute to that population. In many real-world systems, however, migration does occur and thus there is some outside influence on the system that may serve to disconnect the otherwise tightly linked density-dependent relationships. Particularly notable examples of such open populations are many species of marine organisms and terrestrial plants and trees. These organisms very often have offspring which disperse in a density-independent manner to other populations via ocean currents or wind. In such situations, the buffering capacity of a population will depend not solely upon internal density-dependent processes, but also upon the magnitude and reliability of offspring supply from other populations. These networks of populations, or metapopulations as they are known, are recognized for the unique population stability they can provide. As with many butterfly species, short-term extinction of a local population may occur; however, indefinite extinction is prevented by recolo-nization from nearby extant populations whose local dynamics are asynchronous. In such situations the ability of an individual population to resist disturbance will be dependent upon the abundance and strength of its connections with other populations in the metapopulation as the recolonization rate is likely to scale directly with these factors. Figure 1 Impact of population-level processes on the buffering capacity of a population to disturbance. 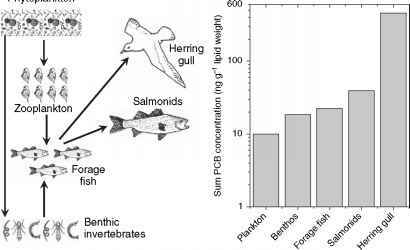 The population in top panels has relatively strong density-dependent mortality and reproduction as well as strong connectivity with other nearby populations which leads to high external supply (density-independent) of propagules (a). This combination of characteristics results in rapid population growth to carrying capacity (b) and thus a population which readily rebounds from disturbances of varying magnitudes and frequencies (c). In contrast, the population in the lower panels has weaker density dependence and connectivity (d) and thus much slower growth (e). This population is much less well buffered and when exposed to the same disturbance regime, and it eventually goes extinct (f). for butterflies above, the end result is similar in that the buffering capacity of these populations will depend upon the strength and abundance of connections with other populations. While density dependence and connectivity are important factors in isolation, it is the mutual consideration of their relative strengths and their interactions that will determine the buffering capacity of a population (see Figure 1). A species of forest shrub may show very rapid increases in survival and fecundity at low population sizes; however, should it lack adequate connectivity with other populations as a source of new propagules, its ability to recover from a disturbance which has dramatically reduced its population density will be significantly impaired. Conversely, adequate supply of new propagules to a disturbed population does not guarantee a successful recovery if that population is not capable of increasing survivorship when densities are low.